Ladies and gentlemen, we'll commence our deliberation of clause-by-clause consideration of Bill C-59. Where we left off last Tuesday was at amendment LIB-8. I'm going to call upon Mr. Fragiskatos to reintroduce that discussion. We left off on Liberal-8. I think everybody knows the wording of the amendment so I don't have to go into that. If I'm going to say anything to it, or if I'm going to speak to it, without repeating myself from last time, I'll just say that the main goal here is to make sure the review agency's activities don't fall into conflict with the work that would be done by police. Suspended complaints investigations would be resumed once any conflict is resolved. I believe we had a subamendment on the table from last week, from Tuesday, in regard to this particular section or clause. We proposed some language. We debated back and forth with the officials and I think the officials have come back with some language that certainly I am prepared to accept as a friendly amendment to my subamendment. I don't think you can be friendly to yourself. You have to be friendly to Mr. Fragiskatos. The question is whether Mr. Fragiskatos sees your amendment, which I would ask you to read into the record, as a friendly amendment and we'll go from there. I see you have that in writing. As it's being circulated to members my first question to Mr. Fragiskatos is whether he sees that as a friendly amendment. I do see it as a friendly amendment, Mr. Chair. I think the department's fine with it obviously. They've come up with the wording. If it's good with them, frankly, I don't have a legal degree and if they think this particular amendment does not compromise the rule of law or any other major legal framework as part of Bill C-59 in general terms, then I'm not going to be very difficult. In fact, as you'll see, with any amendments that I'm proposing I'm open to suggestions. In general terms, I think we have amendments here that respect the rule of law, respect legal tradition in Canada, and I'll leave it to the officials to take up the matter where there could be a major question. The opposition can raise that and I'm open to suggestions, but I think the wording of the amendment in general terms is good. It's generally beneficial not to have a legal degree. I'm therefore assuming that the amendment as amended is before the committee for debate. Is there any further debate? Apparently there's no such thing as friendly. Therefore, the subamendment at this point takes precedence over the amendment. We are to debate the subamendment and then vote on the subamendment. Is there any debate on the subamendment? There's no debate on this side. I just wonder if the officials could weigh in on it. I know I received it from them but they haven't said anything on the record about it. As we said the other day, the amendment's not completely necessary. It's implied that there will be a discussion with the lead agency, or law enforcement agency in this case. But if there's a desire to strengthen that, I think the language is okay. Is there any further debate? The Chair: The debate, therefore, moves to the amendment as amended. The Chair: The next vote is on NDP-7. I won't be moving NDP-7 because I one-upped myself. NDP-8 is the better version of NDP-7. It was submitted 24 hours later. We'll turn to NDP-8, which is, apparently, a far superior version. This is following testimony from the Canadian Civil Liberties Association. It is an amendment that seeks public reporting on the number of warrants requested for the use of CSIS's threat disruption powers. Those who were on the committee at the time will recall that Mr. Coulombe, director, was testifying there was a troubling lack of clarity after the use of those powers, even though they confirmed that they had been used. We believe this is appropriate in order to have a better understanding of these powers, which are not really supposed to be part of CSIS's mandate. Its raison d'être is to not have these types of powers, but that's a debate we'll get to with later amendments. It also seeks to have public reporting on the activities carried out by the national security and intelligence review agency. This is, once again, in keeping with the spirit of accountability and transparency that the agency seeks to accomplish, by having public reports on its activities. With due respect to my colleague, I don't think the amendment is necessary. I don't think it's necessary for the following reasons. NSIRA should be left to determine the statistics that would be most useful to disclose in the public interest rather than being given a list. A flexible approach should help to ensure that NSIRA's annual report stays relevant as national security tools and responsibilities evolve over time. Moreover, NSIRA's predecessor, SIRC, has long published a range of statistics on CSIS warrant applications and the number of complaint investigations it has undertaken, and the NSIRA will likely continue to do so. Moreover, because the NSIRA will summarize each of its reviews in its annual report, it's not necessary to publish the overall number. The NSIRA would, finally, also be required under proposed subsection 8(2) to review an aspect of CSIS's use of its threat reduction powers each year. This will ensure that each annual report discusses threat reduction activity by CSIS. I'd like the officials to weigh in on this, if possible, to see if they feel that this additional reporting process and the types of reporting would, in any way, potentially compromise security issues. The important thing here is proposed subsection 8(2) that was already mentioned. The mandate includes reviewing one aspect of the service's work in threat reduction. The concern, I guess, with the amendment is that proposed paragraph (b) implies a review of all applications for warrants. In a way, there's a confusion or potential expansion of a mandate, which is really a reporting amendment. It's not really directly answering your question in terms of the security implications, but there's certainly a mandate conflict with 8(2), which is meant to be the scope of the reporting on threat reduction. Once again, when I hear words like “likely” and things like that, I would say this amendment is not exhaustive. It prescribes certain things that should be published but certainly leaves discretion for the agency to publish more. Once again, I don't see why we continue to reject things by saying they will “likely” happen, the “odds are”, etc., when we should be codifying these things as much as possible. Moreover, as I said, this will be debated in later amendments, but at the end of the day, as far as we're concerned, threat reduction powers should not be part of CSIS's mandate. That's been an ongoing debate since former Bill C-51. In the meantime, in the same way that there would be accountability for other forms of law enforcement if these powers are going to exist, I do think it's appropriate that they be reported on, as the Canadian Civil Liberties Association said in its testimony to this committee. As I demonstrated with a previous amendment, I'm open to compromise, but on this, I go back to the original point. I don't believe this particular amendment is necessary for the reasons I articulated. I'm curious whether the officials could provide some sort of assurance, then, to the committee with respect to the type of information that would be reported on, which we're talking about here, to maybe alleviate any of those concerns or issues. It's difficult to say. We can look at how the Security Intelligence Review Committee does its work on collection warrants and how they report on the statistics. It depends on the year and the review work plan. They will comment on how the collection warrant process works and so on. It's really about looking at precedent on how SIRC has worked, guided by proposed subsection 8(2), which is their mandate that they must review. The new NSIRA must review an aspect of the threat reduction mandate of the service each year. The Chair: We'll move to NDP-9 with Mr. Dubé. The review agency's report discusses the type of information and structure used by the Communications Security Establishment, the CSE. A recommendation comes from the Canadian Civil Liberties Association, but also from the Citizen Lab, which has dealt extensively with issues related to the CSE. We understand that the legislation remains vague about the type of information that can be collected and what will be included in the report. However, given the rapid evolution of technology, it is most appropriate that we have as much information as possible about the CSE. I think it's fair, just as anecdotal evidence, to require more information to be published about what CSE is doing. We need to look no further than the estimates process, which to their credit was corrected on social media, where we weren't seeing the proper breakdowns being provided. I know this is not directly linked, but once again, to the earlier point I made, I think codifying additional accountability is appropriate. That's what this amendment seeks to do, once again, in keeping with Citizen Lab's and CCLA's recommendation to this committee. For our part, we are concerned about the disclosure of information on the organizations in question. We may be wrong but we would like some clarification on this. We believe this information could be intercepted by foreign intelligence agencies. At some point, the strictures of Canadian organizations will have to be updated. Are we right to believe that being too open might be problematic? My question is for Mr. Davies or Ms. Henderson. I would defer to my CSE colleague in particular as it's geared to CSE, but the suggestion is really around the structure of the organization, and the structure of the organization is more or less already on the website and already transparent. It will not likely change year to year. It's also about information in the annual report, so you're asking NSIRA to make commentary on how to improve their annual report, the statistical information required, and so on. I don't think it's so much a transparency as a concern of a foreign intelligence threat aspect. It's just more the point that NSIRA already has the capacity to ask for and review any of this, so I think it is in many ways redundant. My concern is that, if we're reporting this, isn't this the type of information that foreign entities might be interested in, from our perspective? We focus our resources to defend Canada, and if we were to report on those, would those not potentially compromise CSE? Again, NSIRA's reports are always going to be unclassified. They're going to redact anything that could affect things in that way. I don't think that is so much of a concern. I'm curious whether CSE is known on electronic databases such as GEDS. No, I don't believe so. Our senior management is on GEDS and information about us is on InfoBase, which is a TBS website that carries some of this information. The Chair: We'll go to amendment NDP-9.1. On NDP-9.1, I'm seeking clarity on the consequential amendments, because I have a few in there and this would kick-start a longer process. I'm wondering about that before I proceed. What I'm told is that if NDP-9.1 is adopted, so are NDP-9.2, NDP-9.3, NDP-9.4, NDP-9.5, NDP-9.14, NDP-9.15, NDP-9.16, NDP-9.17, NDP-9.18, and NDP-9.19. Similarly, if it's defeated, so also are all of those. As you know, one of the most controversial aspects of former Bill C-51 was the information-sharing regime that was put in place, known as SCISA, and Bill C-59 brings essentially a cosmetic change alone to that regime. As far as we're concerned, this remains a problematic system to have in place. NDP-9.1 and the consequential amendments seek to fully repeal the elements of the bill that allow for this information sharing to take place. I think what we heard earlier is that new obligations with regard to CSE, its organizational structure, and basic operations are unlikely to change much in most years and would not be an effective use of NSIRA's finite resources. That's one concern, but there are others as well. I won't be supporting the amendment. I don't think it's necessary. If I may, I want some clarity. You're referring to information sharing under what would be the new SCISA, which is, I believe, in part 5. Can you explain to me how you see the interaction between the NSIRA part—because that's the review part—and the SCISA part? Since this is the part of NSIRA act that deals with the Security of Canada Information Sharing Act, these are just consequential amendments to remove all the references in the efforts that we're making to fully repeal that. Every reference in the bill, whether it's in this part or in part 5, is being deleted. This is seeking to remove this part, since if our efforts were successful, and we did manage to repeal these problematic elements, then it would obviously require these types of consequential amendments in the NSIRA act. It has nothing to do with NSIRA's mandate proper. It's a cleanup. It's interesting, though, that because of the way the act is paced out, it ends up being a bit of the cart before the horse, because we have not considered any of those part 5 pieces. I'm trying to figure out how it works. I understand we have to work sequentially through the act. I'm trying to sort it out, because right now we're dealing with technical cleanup in part 1 with regard to changes that you want to be making in part 5. There might be nothing we can do about that, but what happens in part 5, ultimately, when we discuss those parts—and we haven't had those discussions—could impact what we're doing as far as cleanup pieces here. Maybe the clerk can help me on this. We're not exactly roaring through this bill. In the event that there are other amendments in and around part 5 that someone wishes to put forward, I'm sure they will be well received. We don't know yet what we're going to be doing in part 5 because that part hasn't been discussed here. I guess that's more my question. I understand fully what he's trying to achieve by cleaning up beforehand, but is there a way procedurally that we can park these, only because it's cleanup based on a discussion that we haven't had yet in part 5? I say this with all due respect to my colleague. I think that we've studied this bill for a number of months now. I think it's fairly safe to say that members on the other side already have a sense of how they will be voting on part 5 and on the amendments that are tabled related to that. It's just that I'm following the procedural rules here that were imposed on me. I've drafted all the necessary amendments. I can assure my colleague that I will be more than happy to move all those amendments to fully repeal this problematic part of the bill, and this is just due diligence. It was the law clerks of the House of Commons who helped us put all this together, so my fate is in their hands and they were, as always, very helpful. If I may, I'm actually just trying to be helpful to my friend across the way in trying to allow for full discussion about what he wants to do later on. But if we must go through this way, we must. I was actually trying to create an opening for us to have that discussion in part 5 more clearly, because there are parts that we may want to discuss. I'm just trying to create that space. We appreciate the helpfulness on both sides. However, I see no further debate on this, so I'll call the vote. Bear in mind, as I said earlier, if NDP-9.1 is adopted or defeated, so are NDP-9.2, NDP-9.3, NDP-9.4, NDP-9.5, NDP-9.14, NDP-9.15, NDP-9.16, NDP-9.17, NDP-9.18, and NDP-9.19. The Chair: We'll be then at NDP-9.6. Is that correct? Mr. Chair, even though they're not admissible, I still get to state the case, do I not? Actually, my ruling is premature because you do get to introduce and make your case, and then I will rule them inadmissible. I appreciate that, Chair. I hear the roaring train coming my way. Once again, these are just consequential amendments related to the full repeal of all the information-sharing provisions in Bill C-59, which are just cosmetic changes to what was in Conservative Bill C-51. The ruling is, and will be, and is now that these are inadmissible. So there we are. We're then going on to NDP-9.14, which was defeated. NDP-9.15, NDP-9.16, NDP-9.17, NDP-9.18, and NDP-9.19 were defeated. Do we have an NDP-9.20? No. We'll go back to LIB-9. Good morning, Mr. Chair, and thank you. Amendments LIB-9 and LIB-10 go together, and both are connected back to LIB-1. These are technical provisions that deal with the mobility rights of public servants. What LIB-9 aims to do is to remove provisions that exempt the review agency secretariat from most of the Public Service Employment Act, so that under the amendment the entire PSEA would apply to the review agency secretariat, not just part 7. In the subsequent amendments, the removal of proposed section 48 of the NSIRA act, which governed these mobility provisions, is being proposed so that subsequent to LIB-9 and LIB-10, the entire PSEA would apply to civil servants under the review agency secretariat. Once again, these are technical amendments. They would leave the substantive rights of review agency secretariat employees effectively unchanged. I'm curious to know why employees are required to be under the act. It's not a requirement; it's an entitlement. They have the entitlement to move within the public service. The act essentially gives them that right. It's being moved from the NSIRA act to the broader Public Service Employment Act, or PSEA, that also governs the mobility rights of other public servants. Is that a normal practice, to have that language among agencies? I take it from the nodding of heads that the answer to that is yes. The Chair: We'll move on to LIB-10, Mr. Spengemann. In the same vein, LIB-10 is the amendment that effectively removes proposed section 48 of the NSIRA act and thereby brings the entire mobility scheme of federal public servants under the PSEA. I would like some explanation from the officials. When C-59 was drafted, a dedicated mobility scheme was created to allow employees from the federal government to move in to NSIRA and move out. You'll see this again with the intelligence commissioner. In hindsight, that was a mistake. That should not have happened, following further legal advice, discussions with the Public Service Commission, and so on. All these amendments do is strip out the dedicated regime that was built and use the exact language in the PSEA. I'm curious to know whether this will have any impact on the sharing of information. It will make it easier to hire people in NSIRA, and you'll see in the intelligence commission, it will be a lot better for them to attract the kind of people they need. There will not be any future procedural problems with people moving in or out of those agencies. You have comments on LIB-11, Ms. Dabrusin. To me, oversight has been one of the most important parts of this bill and what's being introduced. This amendment on page 21 goes to help that because it makes sure that despite NSIRA's scope of duties, it's clear that other bodies such as the Office of the Privacy Commissioner can continue to carry out the full range of their mandate. It creates that ability. It makes it very clear that NSIRA is not taking the full space. Other oversight can continue as well. I would submit that's an important change. Mr. Motz, you're up to talk about CPC-11. CPC-11 , as you'll see, is a coordinating amendment for CPC-12. It's a language change for what we want to talk about in CPC-12. It's adding a reference to proposed section 17.1 to it so we can then deal with CPC-12 as an amendment. We all simply have to vote for it, and we can continue. We'll deal with the debate on CPC-11 and CPC-12 as if they are one. But bear in mind that when it comes to the vote, if CPC-11 is defeated, CPC-12 is also; and if CPC-11 is adopted, so also is CPC-12. Why don't you make your debate points with respect to both CPC-11 and CPC-12? What we're really asking for in CPC-12 is that it require the Minister of Public Safety and Emergency Preparedness to outline the roles and responsibilities of multiple national security agencies and departments after one year of C-59 coming into force. This will help identify overlaps and duplicated work and may potentially lead to further consolidation or disbanding of agencies or departments. Mr. Fadden told us that this bill is beginning to rival the Income Tax Act with sub-sub-subsections in its complexity. There are excluded subsections of subsections of subs, and there are exempted ones. If there's anything the committee can do to make it more straightforward, Mr. Fadden and others have encouraged us to do so. That's why the creation of proposed section 17.1 is in this particular subamendment. We're talking about CPC-12 and CPC-11 at the same time, just because it makes sense? NSIRA staff already have the authority to obtain information on national security relationships. We don't need to add the burden to create these reports onto ministers as well, because NSIRA already has access to the information that it needs. I would suggest that this is duplicative of what we already have in the statute as it has already been built out. As I understand it, this would be like a one-time requirement because it's in the first year of C-59 coming into force, and it's setting up the rules around what that should look like. It's about making clear for Parliament and for agencies what the outline will be and what the prospective relationships and responsibilities would be because we don't exactly have those clearly defined yet throughout C-59. Mr. Chair and dear colleagues, Bill C-59 is an omnibus bill. So there are already a lot of stages and steps. I don't think we can accept the argument that it adds something. It's already complex. As my colleague mentioned, when Mr. Fadden, the former national security advisor, came to testify before the committee, he confirmed that it was really complex and difficult to understand. I think we should take into consideration the fact that a man like him is telling us that it isn't clear and that he hopes the committee will try to find solutions to make things better. Were you directing your comment to Mr. Davies, or was that just a comment on your part? It was a general comment, Mr. Chair. I would imagine there's no shortage of complex legislation on Canada's books. I'm wondering if Mr. Davies could inform the committee if there's a standard practice or what the best practice would be for an organization, potentially including a new organization, to figure out and delineate its reporting relationships. It is a new organization, but it's going to be built on the foundation of existing review bodies, which already have a high degree of expertise. The assumption here is that there would be a lot of initial briefings. We just saw that with the new committee of parliamentarians on national security. There are a lot of initial briefings to make sure everyone's familiar with mandates, how they work, reporting structures, and so on. It's up to the committee whether you need to legislate that in, but it's kind of an obvious first thing you would do after royal assent. Mr. Chair, let me add that, at the moment, all these interactions remain unclear. The problem is interactions between agencies. The purpose of our amendment is really to allow the Minister of Public Safety to clarify these interactions by providing accurate descriptions. Once Bill C-59 is in effect, we will be a bit like the Tower of Babel. I thought it was actually quite helpful to hear from Mr. Davies on that point, which is about how much you have to have specifically written down here, and how much we know can happen as it is, and already does happen with other pieces of complex legislation. I stay by my position that this is an unnecessary burden, given the responsibilities and the access that NSIRA already has. From what we heard from Mr. Davies, that gives me extra comfort to stay with my position. You'll have to ask him afterward. The Chair: As I indicated earlier, with CPC-11, CPC-12 is also defeated. The Chair: Next up is CPC-13. We believe that this amendment, then, at the request of the Privacy Commissioner, would actually properly deal with that issue. I'm halfway there because I actually agree with you about the need to allow for that information exchange with the Privacy Commissioner. If you remember, we had started setting that up in amendment LIB-7, and there's another amendment that follows yours directly, LIB-12, which closes the loop with the LIB-7 amendment to allow for that information exchange between the two. I know we're considering that one after yours, but I submit that the wording of LIB-12 is quite comprehensive and would in fact address what you're talking about, allowing the information exchange back and forth. I was going to make the same comment. I would like to know what my colleague Ms. Dabrusin's objective is with amendments LIB-7 and LIB-12. I'm not a lawyer and I don't know if the powers granted by these amendments would be the same as what is proposed in amendment CPC-13. Can we take a short break to validate this information? I'm very hesitant to get off track. It's not as if people haven't had an opportunity to look at these amendments. Mr. Dubé asked a question about the legal implications, which I think is legitimate. If there is some consultation that needs to go on with our Conservative colleagues, maybe you could have it while Mr. Davies is responding. Mr. Chair, to have us just go talk among ourselves for one minute at the same time as you're suggesting the committee hear from one of the witnesses who is here is counterintuitive to my privileges as a parliamentarian. I don't suspect any ill will here. We're trying to just sort it out, and we have two amendments before the committee, one proposed by the government side and one by us. We're simply trying to sort out in our opinion which one is going to serve the best interests of Canadians. I don't think we're being unreasonable with that. We're not trying to filibuster or stall anything, and to suggest that we need to go talk in the corner while somebody is here to testify to something else that is currently before this committee is not really conducive to my rights as a parliamentarian. I'd ask you to reconsider that. We all have to walk and chew gum at the same time. Having said that, I am open to a one-minute adjournment, which will be strictly one minute, after Mr. Davies responds to Mr. Dubé's question. The main issue here is that CPC-13 includes exchanging information related to complaints. It's setting up a system whereby the Privacy Commissioner can share complaint-related information with NSIRA. LIB-12 does not. As we mentioned the other day, sharing information related to the complaint process could create problems for procedural fairness. What about with regard to LIB-7, which was already adopted? It's the same thing. LIB-12 and LIB-7 are similar in that regard. Okay, we are suspended. Do you still want your suspension? I have a follow-up for Mr. Davies. Were you consulted on LIB-12? Were you consulted on that language and whether it would be substantially different from CPC-13? Yes, I believe the policy intent was to make sure the sharing of information related to complaints would not be included. Okay. At the request of our Conservative colleagues, we will have a one-minute suspension. Colleagues, could we resume, please? Thank you, Chair. I appreciate the opportunity for us to have a quick chat about this. I'd like to ask Mr. Davies about this. I'm looking at the proposed amendment in CPC-13. Mr. Davies suggested that the Privacy Commissioner would have the ability to share information pertaining to complaints, which is different from the amendments proposed by my colleagues across the table, yet I don't see where that is. Could Mr. Davies please explain to the committee where that is so that we could potentially propose an amendment or a change to it? If that's a concern that we happen to agree with, we could amend our amendment accordingly. I would have to talk about amendment LIB-5. You'll see that the mandate in proposed paragraphs 8(1)(a) to (c) is what they're allowed to share information on. Proposed paragraph 8(1)(d) is the complaint mandate. It's not included in LIB-12. Complaints are not part of LIB-12. That netting off doesn't appear in CPC-13. Our amendment is actually hinging now on an amendment previously adopted here at the committee. If we're going to deal with it, then we would need to make that provision. While you are thinking about that, Mr. Calkins, I'll get Ms. Dabrusin's comment. Ultimately, it seems to me that what we are talking about is this: do we favour the approach taken by LIB-12 or the approach taken by CPC-13? To me, it just comes down to a vote on that point. It's just a matter of which approach the committee favours. I do agree with the officials. I don't have that act in front of me, where we changed it to include complaints. We do not want to include complaints in this sharing of information. We agree with that 100%. If it's easier to accept LIB-12 and have ours defeated, I'll just have hurt feelings. That's it. At the end of the day, we'll be fine. We are now on to LIB-12 with Ms. Dabrusin. I believe that most of the discussion we were going to have about LIB-12 has already happened. This was the preferred method of allowing the Privacy Commissioner to work with the agency. I say that we should just get to that vote. Before we get to that vote, colleagues should know that if LIB-12 is adopted, so is LIB-13, because it's consequential. Similarly, if it's defeated, so also is LIB-13. The Chair: On clause 41, we have NDP-10. This is related to the testimony we heard from the RCMP complaints commission. It seeks to add proper clarity with regard to who has the authority over complaints made with regard to the RCMP when it's of national security in nature and when it's not. This was a concern they raised on their ability to do their work. I think it's important clarity. Mr. Chair, my concern is that this could lead to an inefficient back-and-forth. The topic itself will make clear if the issue is a national security matter. That's also my concern, by the way, for NDP-11. I realize we're not there, but I raise it now. I would agree with my colleague across the way. I'm not sure this needs to be legislated. It seems to me that a matter of simple professional courtesy between government agencies would take care of this. The amendment, frankly, assumes that some of that common sense or professional courtesy is lacking in the administration. When we try to legislate common sense, sometimes we get into more trouble than we need to, legislatively, with our agency. I wouldn't be in favour of this. The way it was described to us by the head of the complaints commission was that, if the commission sends a complaint that is national security in nature to NSIRA, and NSIRA deems that your evaluation is incorrect, that it's not national security and it's not part of their mandate, then the complaint is dead in the water after that. I understand points that are being made about professional courtesy and efficiency, but at the end of the day, accountability is not always as efficient perhaps as we would like. I certainly don't doubt the intentions of these bodies, but I think that, by codifying a proper back-and-forth in the event the complaints commission deems it to be of national security in nature and NSIRA has an opposing view, the complaint can still be handled by the complaints commission in the appropriate fashion. I'm curious whether the officials can weigh in and tell us how the process works now and how that information is shared in this circumstance, because we don't know. How do you see it? As you mentioned, agencies and departments figure out ways to talk to each other, and common sense prevails. If something looks like a national security complaint, it would be referred and dealt with. There's no indication, though, that the complaint would be dead and that it would just go nowhere. If, after some other information was revealed, it should go back to the CRCC, there's nothing preventing that. I just find, as we go through these amendments, that a lot of things are being taken on blind faith, and there's a hesitancy to codify things. Again, this is something that the head of the complaints commission raised as his concern about his ability to do his job. I think it speaks for itself that an esteemed head of a commission testified before the committee and raised this concern. Once again, while I have no doubt about common sense or intentions on the part of these different bodies, I think that making sure that the official channel is there for that information to go back to the complaints commission and be dealt with appropriately is proper. There are times, when we're looking for accountability and transparency, when codifying things in law can be appropriate and not just taken on blind faith. With all due respect, blind trust plays no role here. These institutions, which I have some experience with in the field, have improved and developed over the years. The exchange of information in this type of file is in the common interest. So, the understanding of how these agencies operate in the field is not the result of blind trust, but rather of long practical experience. I'd like to circle back to Mr. Davies one more time to ask the question of best administrative practice in the Canadian public service. If the head of the complaints commission makes a referral to another commission, and that referral is denied on the basis of lack of substantive jurisdiction, that does not extinguish the accountability of the head who initially referred it. It is still her or his file to dispose of as administratively regulated. Is that correct? Mr. Dubé, do you want to weigh in further? I want to raise the issue that, without questioning the ability of public servants and so forth, I've been doing this long enough to know that there are certainly many times when departments don't communicate effectively. Again, I just don't see the problem in making sure that it's there in the law. If everyone believes that it's something that's going to happen anyway, then I don't see the harm in codifying it to make sure that what everyone around this table seems to believe will happen anyway will happen. This is part of the law. At any rate, it seems to already be a foregone conclusion. We heard from national security experts that the sharing of information has been a problem. Mr. Davies, what assurances do we have that C-59 will take care of that? How will information be moved in the context of complaints related to CRCC? I'm not sure how to answer your question. Another part of the act, the Security of Canada Information Sharing Act, is about how information moves within the federal government. It's different from the complaints process, though. Do you want to refine your question or are you satisfied with that answer? Yes, it is specific to complaints and what NDP-10 is talking about. Seeing no further debate, all those in favour of the amendment? Mr. Chair, I request a recorded vote. We will have a recorded division. Go ahead on NDP-11, Mr. Dubé. The debate is the same as the one we just held. Once again, we want to make sure that the legislation clearly dictates what everyone seems to take for granted. The logic we followed is based on the testimony of the commission head. He said very clearly that he wanted to see this provision in the bill so that he could work as best as possible with this new body. I will add one point that I did not raise during the debate on amendment NDP-10. During the debate on Bill C-22, for example, we were told that there were a lot of things to study, that it was difficult, that it was a new entity, that best practices should be included, and so on. But I think, with respect to the creation of this new body, that by codifying as much as possible, we make sure that no complaint will be inadequately handled because the new organization has not been sufficiently well grounded to do its work with the commission. Again, I think it's appropriate, but given the fate of amendment NDP-10, I imagine NDP-11 amendment will be the same. NDP-12 is consequential to NDP-11. If NDP-11 is defeated, NDP-12 is also defeated. If NDP-11 passes, NDP-12 is also adopted. Now we move on to LIB-14. The amendment is intended to require the Civilian Review and Complaints Commission to notify both the RCMP and the complainant when it refers a complaint that is closely related to national security to the new review agency. It goes to the RCMP first to mitigate harm to any possible operations. Mr. Dubé will go first, and Mr. Paul-Hus second. I'm intrigued that a member who just told me my amendment would create inefficiencies is now proposing amendments that would have the notifications being required, which essentially would also arguably be an efficiency. Essentially we're asking the same thing, but going only one way and far less stringently. I'm having a hard time following the logic, but at any rate I'll support the amendment with a lot of water in my wine. Mr. Paul-Hus, how is your wine? My remarks are close to those of Mr. Dubé. We have the impression that this will only add a layer of paperwork and documents to complete. Can the merits of that be explained to me? We do not necessarily oppose this idea, but we would like to know if this will generate more paperwork. The head of the CRCC had asked for this in terms of clarifying when the complaint is notified and also making clear the sequence, that the commissioner of the RCMP should be the first to know, to give a pause to make sure to understand the effect on operations. From our point of view, this can be traced back to the CRCC. We move on to LIB-15. Much the same here. It requires the CRCC to notify the RCMP, and for the reasons offered already, the RCMP should be notified first. It's a sequential matter. I imagine that your answer will be the same as for the other amendment, Mr. Davies. I don't understand why we would adopt amendments where we're informing them in writing, but we can't adopt amendments where they would just send the frigging complaint back to them. It makes no sense to me at all, but at any rate once again for the same reasons I'll support it, but it's just bizarre, quite frankly. I'm sure Hansard will note that “frigging” is possibly not a word of parliamentary significance. The Chair: We are now on LIB-16. If I may, Mr. Chair, because this amendment is a bit more sensitive and sensitive, I will take a little more time to explain it. Torture is still a very sensitive issue in Quebec. All the consultations I've done for the government show me that this is true in the rest of Canada as well. In the last two years of this process, I have never heard of stories of torture in Canada. It is therefore certain that torture is envisaged in the context of exchange of information between countries. In September 2017, Minister Goodale issued new departmental guidelines to avoid complicity in cases of abuse by foreign agencies, guidelines which have been warmly welcomed by the security community. In committee testimony, professors Craig Forcese and Peter Edelman of the Canadian Bar Association, both wanted the 2017 departmental directive to be enshrined in legislation. That's why today I am proposing an act to prevent complicity in cases of abuse by foreign entities, to make it very clear that Canada will not be an accomplice to torturers around the world. More technically, the proposed legislation requires the Governor in Council to issue instructions for the disclosure, request and use of information that would result in a serious risk of ill-treatment of an individual or is likely to result from ill-treatment inflicted on an individual by a foreign entity. Instructions must be given to the chief of the defence staff, the deputy minister of National Defence, the deputy minister of Foreign Affairs, the commissioner of the Royal Canadian Mounted Police, the director of the Canadian Security Intelligence Service, the president of the Canada Border Services Agency and the chief of the Communications Security Establishment. Micheal Vonn from the British Columbia Civil Liberties Association also appeared before the committee to discuss the problem of secret legislation and directives. Professor Wesley Wark said it was very important that departmental directives be made public. That's why the last component of this legislation is that its instructions are made public. There is no reason for guidelines on torture to be decided behind closed doors. I would like to thank my colleague for his amendment. We have long been waiting for these measures to be inscribed in law. What we have seen over many years, if not decades, is that the departmental directives were not sufficient. Certainly this is extremely important, especially when we think of cases that are still relevant today, such as I had the opportunity to raise yesterday during question period. In short, I am very happy to be able to support my colleague's initiative. It must also be said that a significant follow-up will have to be ensured in order to evaluate the effectiveness of these measures in time and place. After all, all too often the consequences of information sharing, as my colleague said, do not happen here in Canada. It is rather as a result of the sharing of information that we observe this kind of blunder. I commend my colleague for his efforts, and I am happy to support them. Indeed, torture is an extremely delicate topic, and it has major implications for people's lives. However, in our opinion, there is one essential point with respect to national security. Of course, we are against any form of torture—we agree on that, I want my words to be clear—from Canadian organizations or from anywhere in the world. We are totally against that. However, for us, one point is clear, and we have discussed it over the years. Take the case of information from a foreign source that would involve the safety and security of Canadians or Canadian infrastructure, such as an attack, and that would have been obtained in a way that we don't support, through a form of torture, for example. We consider that, in such a case, for the protection of Canadian interests and especially of citizens, our security agencies should be able to intervene, despite the fact that the information would unfortunately have arrived in a way that we do not wish. Ms. May has indicated that she wishes to make a very small intervention, but I can only do that with the unanimous consent of all colleagues. I want to say how deeply grateful I am to see this amendment. This was one of the weakest parts—well, there's another part that I'll get to in my amendments—of Bill C-51, in trying to remedy the damage. We could call this the “Maher Arar act”. I'm deeply grateful to see this amendment and I hope it passes. This is really a bill in itself. This is not being debated by parliamentarians in the House. It's a big deal. It's something that's new. I don't know if we can do it justice here. My concerns, as my colleague has indicated, is that in circumstances—and we don't agree with the idea of obtaining information through torture in the first place—where information is obtained in that way and somewhere in Canada we have an imminent risk, are we not going to act on that? Are we going to ignore that information? That's what you're saying, that we're going to ignore it because we're not going to accept that information as being admissible or being able to be acted upon. We're going to ignore it and who pays the consequences of that? I get that we have to be careful. I get that this is an area that we have to tread on very, very carefully. I'm concerned that in exigent circumstances, we are opening ourselves up to the potential for public safety risk, national security risk. I want us to be mindful that this is what this act is all about. We don't go out seeking it. We don't go out endorsing the gathering of information in this manner. However, we need to be mindful that should it present itself, we can't ignore it. I think that's something we have to be very mindful of. In this day and age, putting our heads in the sand and hoping we'll never have to deal with this might be naive. I have a couple of points. First, I'd like a recorded vote on this amendment when we get there. Secondly, either we don't approve of torture or we do. It's one issue that I believe is black and white. I applaud my colleague for introducing this amendment, and I think all of us on this side are very proud to be part of a committee that is including this, assuming it passes on the vote. I also think it's important to point out—and it's well known—that information obtained by torture is notoriously unreliable. To imply that we're putting the country at risk is just wrong. We know that information obtained through torture is likely not going to be accurate. If we're condoning it and then it's coming here and we're acting on it, we're complicit in that torture. I totally support my colleague's amendment. Also, in terms of being debated in the House, we know that this bill has come to us after first reading. It will be going back to the House for second reading. There will be an opportunity for it to be debated there. I think there's no grey area when it comes to torture. I categorically refute what Ms. Damoff has said. To suggest that a vote against this particular clause means that somehow you're in favour of torture is somewhat disingenuous. There are plenty of reasons to have concerns about an entirely new piece of legislation being introduced into another piece of legislation at committee stage. However, I was heartened by what Ms. Damoff said, and that was going to be my question to the government side. What assurances can you give the members of this committee about this? We find ourselves in the peculiar situation where this committee is studying a bill before it has been voted on at second reading in the House of Commons. It could go back to the House and be deemed at report stage that it has already passed second reading and that it be adopted as such. It could then go straight to third reading. It would mean that this piece of legislation that's being added to an already existing piece of legislation would have never been debated in the House at second reading. If I can get some semblance of a recorded assurance from my colleagues across the way that this bill will indeed go back to the House and get fulsome debate at second reading, it might allay some of the concerns I have of a technical and procedural nature. That's notwithstanding that I'll be coloured as a supporter of torture should I choose to vote against this as a matter of principle and procedure. To my colleague, Ms. Damoff, I would think it would be incredibly naive to suggest that any agency would act on information or intelligence that was gathered solely through the use of any torture. I want to make it very clear, as Mr. Calkins just said, that my dislike for this amendment does not in any way, and should not in any way, suggest that I support the use of torture to gather information. But I think we need to give credit to our security agencies who would have other corroborating pieces of evidence and intelligence that would support further information that might be received from another country in regard to this. It would only add support or add clarity around some issues. I think it would be important to appreciate that we don't have experts to speak on this here today. We should probably hear from them in regard to that. I'm just concerned with blanket statements that suggest we might put the Canadian public at risk or national security at risk because we do or we don't deal with this. There's a bigger picture we have to look at here. You have to get along well, and it has to be well recorded. The information that will come out of here should not go in the opposite direction of what was said. We agree on everything written there. There is no problem. As for the spirit of the law, we all agree. Only the question of information from foreign agencies, which is dealt with in paragraph 3(1)(c), on page 51, is problematic. We just want to make sure that if Jordan's intelligence services, for example, send us information, we won't have to evaluate its quality. As Ms. Damoff mentioned, the information could be wrong. Suppose that the Jordanians send us information critical to the safety of the Canadians, and that they had to use a little force to obtain this information. I am talking about Jordanians, but it's only an example. If Canadians are in danger, we want to be able to use that information. The rest of the bill doesn't cause us any problem. We support it 100%, except for the lawful denial of information from countries where some form of torture may have occurred. I think it's reasonable on our part. We propose that paragraph 3(1)(c) be removed. Before you move the amendment I want to recognize Mr. Dubé and Mr. Picard. Then, when we get to the end of the debate, we'll deal with your amendment. In terms of hearing experts on it, this situation came up numerous times during the testimony on this bill as something that was missing from the bill. It came up numerous times during the consultations that we did as part of Canada's national security framework review. I would echo what Ms. Damoff said in the sense that the only times we've ever seen information sharing leading to torture have been situations where lives were not in danger. They were extraordinary renditions in other countries and information being shared in that way. I think we're in a situation here where it's clear that the public safety objectives that parliamentarians want to achieve are better achieved by not using this kind of information, without even getting into the obvious point of who we are as a country and what we want to accept. At the end of the day, frankly, the things that we want to be combatting through the public safety objectives that we're achieving, the horrible things that go on, whether terrorism or other crimes, this is when those people win as far as I'm concerned, when we're finding ourselves in a situation where we need to debate whether or not we're going to use this type of information. The experts all agree there's never been a situation where lives were saved or could have been saved had this type of information been used. I would just once again echo my support for Mr. Picard's amendment and say that the fact that the bill was referred here before second reading gives us the opportunity to do something like this. As far as I was concerned in my initial criticism of the bill, and as Madam May said, I still have other points that are problematic, but this was a huge omission. To have it in here is certainly a very positive step. We'll have Mr. Picard, then Mr. Spengemann. I'd like to bring conclusion. I'd like Mr. Spengemann to go first. Thank you very much. I'd like to thank colleagues around the table for their expression of support of this amendment. I had the privilege of serving in Iraq as an official of the United Nations between 2005 and 2012. During that time, the Abu Ghraib scandal broke. Nothing flies in the face of human dignity as does torture. This is a practice where really the only answer is the one that's been echoed by colleagues here, which is to stand up and to take a position that is firmly against the practice and all its aspects. There is nothing to gain here, and we're working towards the elimination of torture globally, so we have no choice but to follow Mr. Picard. I'd like to congratulate him on the amendment. I support it wholeheartedly. Before I call on Mr. Picard, is there any other wish to debate? I've received no assurances from any of my colleagues on the other side to the question that I had that, if this bill or when this bill passes through this committee and gets reported back to the House, we will have good opportunity for good and fulsome debate on this bill at second reading, hopefully without the notion of time allocation being brought in so that we can thoroughly investigate the addition of another piece of legislation into this legislation, notwithstanding the fact that there may have been people talking about it. No formal witnesses were called specifically to testify at this committee prior to the second reading on this amendment, which is a new piece of legislation. I'm very concerned about the precedent of parliamentary procedure being set. With this, I know that it's in order or else we wouldn't be discussing it, but I haven't received the assurances from my previous intervention on this. That can't be guaranteed in the same way that a Conservative filibuster on Bill C-59 can't be guaranteed. Robust debate will take place, and we'll have it out there. That's simply not true, Mr. Fragiskatos. The government controls the actions that happen in the House. While I can't guarantee that we won't filibuster, I can't guarantee that you won't filibuster, but your party can guarantee that this bill will be accepted back into the House prior to second reading and we'll have an opportunity to have that debate. That is totally within the purview of the government. I just want to answer Mr. Calkin's question. It will be reported back to the House, and there will be debate at second reading. Mr. Picard, do you want a final word? I would like to thank all my colleagues for their comments on this amendment. The content and the seriousness of the thing demonstrate the importance of this subject. It's important to remember that the amendment is part of BillC-59. And the amendment has a dual purpose: the protection against torture and the assurance that we must protect rights and freedoms. With this amendment, the government is reiterating its position and intention to be an international leader and a model for the protection of rights and freedoms. This amendment therefore has its place, and it has been long awaited. I invite everyone to vote for it. Mr. Paul-Hus, I'm assuming that's the end of the debate. Mr. Paul-Hus has a subamendment to delete proposed paragraph 3(1)(c). Would you move your amendment, please? Given what I mentioned, I propose that paragraph 3(1)(c) be removed. The vote will be first on the subamendment. Do you want a recorded vote? Okay. We have a recorded vote on the subamendment. The Chair: The subamendment is defeated. We are therefore voting on LIB-16 as presented. Do you want a recorded vote again? Yes, you asked for it, that's right. Do I have the floor? I've already called the vote. The Chair: We are now on clause 50, and NDP-13. This amendment is similar to the one I proposed for the first part of the bill to allow Parliament, that is, the Senate and the House of Commons, to approve the appointment of proposed members for the review agency. In this case, I am proposing the same thing, but this time the appointment of the intelligence commissioner. In that context, I think it's even more important than for the first part of the bill because the commissioner will, for the first time, conduct real-time monitoring of transactions and approvals. It is therefore a matter of having the approval of the House of Commons, and not just an appointment by the Governor in Council of the person recommended by the Prime Minister. I think it is entirely appropriate given the importance of this position. As I said during the debate on this other amendment I had proposed for the first part of the bill, Parliament must already approve a number of important posts, including those of the Commissioner of Official Languages and the Auditor General. I don't see why it wouldn't be possible to apply the same principle to the equally important position of the intelligence commissioner. Before I ask for debate, I note that if NDP-13 is adopted, NDP-14 and CPC-14 cannot be moved. The concern with this amendment is that it requires parliamentary approval as a precondition of appointment of intelligence commissioners. It's inconsistent with established practice. It's a concern for another reason, which is basically that intelligence commissioners would be retired judges, women and men with a lifetime of impartial service upholding the law. The introduction of a parliamentary process could not only dissuade candidates from serving; it could also risk politicizing the appointment process. It should be focused on the rigorous application of the law or the candidate's qualifications with respect to sensitive national security considerations. It's not a place for politics, in my view. I suppose the Prime Minister making a recommendation of who's in the position is inherently political. If the Prime Minister has that purview as a politician, an elected one—not directly elected mind you, but I think folks understand my meaning—then I don't see why we couldn't do this. As I said, all these other positions are normally filled with such candidates. Unfortunately, that's not been the practice lately, as we saw with the debacle around the official languages commissioner. Chair, you'll recall, you were a member at the time, the Liberal Party staged a walkout on the vote on the Auditor General in the last Parliament, the candidate that was put forward. Certainly I don't think this type of thing besmirches the ability of the person to do their job. I think it's an accountability mechanism on the Prime Minister and the selection that he's making for this unprecedented but important position. Contrary to the point that was made, I believe it is in line with existing practices with regard to how many of these types of watchdog positions are filled. Again, I think that falling back on the fact that we've seen less accountability should not be a reason for rejecting more accountability in the context of an amendment such as this. The Chair: NDP-13 is defeated; therefore, NDP-14 can still be moved. This conflicts with NDP-13, but the objective of course was to have other options out there in the event that it failed. Based on some of the testimony we heard, in order to have a larger pool of candidates this would allow current judges to be appointed to the role of the intelligence commissioner as well. Again, I think there is no harm in having a larger pool, given the importance of this role. Again, not to be critical or cast any aspersions or doubt on the ability of retired judges, but as I said, it is something that was brought up and I think it does not force the selection of someone who is active but simply brings them into the pool. I appreciate my colleague's effort to put an alternate option on the table with respect to the Prime Minister's appointment. The concern about this amendment, in my view, is the fact that it leads to the option of appointing a sitting judge. The intelligence commissioner is expected to function independently, but she or he is nonetheless serving the executive branch and not the judiciary. There is a risk of conflict of interest with respect to sitting judges, particularly if dealing with cases involving conduct on the part of CSIS or the CSE. It is problematic also with respect to conduct related to authorizations that could come before a judge that were approved by the intelligence commissioner. In my view it is not a good idea to involve sitting judges as candidates. I understand my colleague's argument. However, from a technical standpoint, can the mandate of a sitting judge not be suspended while the judge is serving as a commissioner? Is there not a way to withdraw that judge's legal powers while serving a term as commissioner? I'm not sure I understand Mr. Paul-Hus' question, but Mr. Davies...? To be honest with you, I can't answer that. I think your question is, can you be a sitting judge and take a leave of absence while you do this? I'm not aware of anything like that. The problem Mr. Spengemann raises is that a judge cannot serve both the executive and the judiciary. I wanted to know whether a judge could be deprived of his or her legal powers while serving as commissioner, which would open a possibility. I'm a little surprised to hear from my colleagues across the way who seem to put a lot of faith in the judiciary when it suits their needs, that the selection of a judge to serve as the commissioner is somehow going to put somebody in a conflict of interest, that a judge who can't seem to sort him or herself out would be in some sort of conflict of interest. Keep in mind that somebody who is called upon can simply refuse if they want to not serve as the commissioner. They don't have to get hauled off the bench against their will to come and serve as the commissioner. This would be somebody who would obviously want the job, and this is a full-time job. I don't see why we would exclude or limit the pool of candidates for something as important as national security by not accepting either this amendment or the amendment that's been proposed by our party, which is going to be very similar in nature. I'm sorry, I have much respect for Mr. Spengemann, but I'm just not buying the argument. Mr. Spengemann, do you want to respond? Just to address the comments raised by Mr. Dubé and Monsieur Paul-Hus in terms of carving out an appropriate role for a sitting judge, I think for that very reason the cleaner answer is to seek a retired judge who is no longer part of the judiciary. The problem is that this person, she or he, will be serving in the executive branch as a sitting member of the judicial branch, and that crossover raises even the perception of a conflict of interest that's systematic. Therefore, retired judges would be much preferable and there is no shortage of retired, talented judges who could fill these roles. The CSE commissioner told us that we'd be better off to expand the pool because we have a limited pool now for this position. That is exactly what he told us. My question to the officials would be this. Currently, does the Privy Council Office not vet and deal with conflict of interest issues in all matters of appointments anyway? Yes, I think the conflict of interest raised here was whether you can be part of the judiciary and the executive at the same time. When you ask to be part of the government as part of the executive, you're making decisions that another part of the judiciary will eventually be asked to rule and comment on. I think that's the conflict of interest. It's not necessarily a personal conflict of interest that PCO would vet normally. I apologize. I can't recall who asked the question of which witness, but it was asked if even retired judges would be in a potential conflict of interest given that they had played the role before, that they have colleagues and such. Witnesses rightfully pointed out that this would not be a concern. I feel that, the way the system is structured, judges regularly make decisions based on decisions of other courts and other judges. I understand the point that's being raised, but at the end of the day there is a concern about having a sufficient number of candidates who are willing, as well, to fill the role. I'm also concerned by this accountability to the executive. While it's part of the executive branch from a technical perspective, the commissioner is approving, or not, actions of ministers in the same way an acting judge would be approving warrants for national security agencies and others. I think this notion that they would somehow be conflicting with each other is no different from an instance when a court case gets referred to the Supreme Court and there are duelling perspectives there, and such. Again, I think that having a larger pool of candidates is appropriate. I agree that we need a large pool of candidates to draw from. In my opinion, a sitting judge now, who would step down from that role if he were appointed, as we heard from experts earlier, he's a retired judge, so it would fit. What are your thoughts on a supernumerary judge? How would that fit with this? Would that expand the pool even more or does that present more problems? I may need a minute on that. The feedback is that a supernumerary judge is still a sitting judge. Would you be of the opinion that a sitting judge or a supernumerary judge, if appointed to this position, would then immediately step down, or is that not the requirement? It's possible. It would depend, I guess, on the individual and their position and when they know for sure. Seeing no further debate I'm going to call the question. Take note that, if NDP-14 is adopted, CPC-14 cannot be moved, as they amend the same lines. If NDP-14 is defeated, so also is CPC-14, as it is identical. I know that's pretty brutal. The Chair: Next up is NDP-15. Once again, without wanting to call into question the person who had filled this position, I think that having the intelligence commissioner limited to one term, which is what the amendment proposes, gives the maximum independence possible without having to be at all concerned with the renewal of the term. Interestingly enough, this was a suggestion made by Monsieur Plouffe, who would be the person who will be occupying this role, it stands to reason, given the changes in the legislation, and who is presently the CSE commissioner. Given that someone who occupies what is essentially a similar role right now, which will be evolving, says that this would be appropriate to ensure that they're not distracted by a renewal of term, I believe it's an appropriate amendment, as I said, to maximize the independence of the position. The function itself requires complete independence and being both a judge and a commissioner would create a conflict of interest, which wouldn't be appropriate. I'm not sure this comment concerns the amendment. It limits the mandate to a non-renewable term. I can't support this amendment because we already know that the appointment in the first place is an arduous process. To find the right individual—and for the amount of time it takes to do that—for five years and then they're gone, regardless of how good they were, we're going to be in a spot where we're going to be fighting to try to find a person. I'm sure it will lead to vacancies in the position. Having that secondary term, the reappointment as is currently written in proposed subsection 4(2), makes sense. I can't support the amendment. Is there any other debate? Sorry, I'm getting ahead of myself again. I apologize, Mr. Dubé. Currently, the commissioner's position is part-time. However, in our opinion, it would be entirely appropriate for this position to be full-time only, given the nature of the work, real-time monitoring, and so on. Given the accountability objectives we want to achieve by creating this position, it would be entirely appropriate for the individual to be fully dedicated to this task. The ruling is that NDP-16 encroaches on the royal prerogative of the government, and therefore, it is inadmissible. That ruling applies to PV-2 and to CPC-15 as well. Mr. Dubé and Ms. May, I see your hands. You can challenge the chair on the ruling, of course, but if you're anticipating some debate, the debate is out of order. Under the terms of the motion that this committee passed which forces me to be here, I'm allowed to speak to my amendments, although they are deemed put forward. Prior to the ruling—when I know the ruling has now been made—I would appreciate the chance to fulfill the so-called opportunity I have to appear before this committee, which I am forced to do. I think you're correct on that. Chair, before we move to Ms. May's comments on her amendment, I'm wondering if I could seek clarification on the decision, on two points. For me as a parliamentarian, it's the first time I've been involved in a committee process for legislation that has been referred before second reading. In the sense of things being able to be outside the scope of the bill, I'm wondering whether that impacts at all. Secondly, given that it's government legislation, there have been a few amendments in this bill that have had similar rulings. I know that for private members' business, you can't supersede that prerogative, but when it comes to a government bill, is there not an ability in that case to make this type of amendment? First of all, it was referred at first reading. Therefore, very little is out of order because the principle of the bill has not yet been established, hence the advantage of a wider scope. That's your first point. As to the second point, it is still subject to the rules of the royal prerogative. Had a government member moved a similar amendment, that likely would have been in order because it would comply, therefore, with the royal prerogative. I think in this instance it is out of order because it causes asking the treasury to spend money. 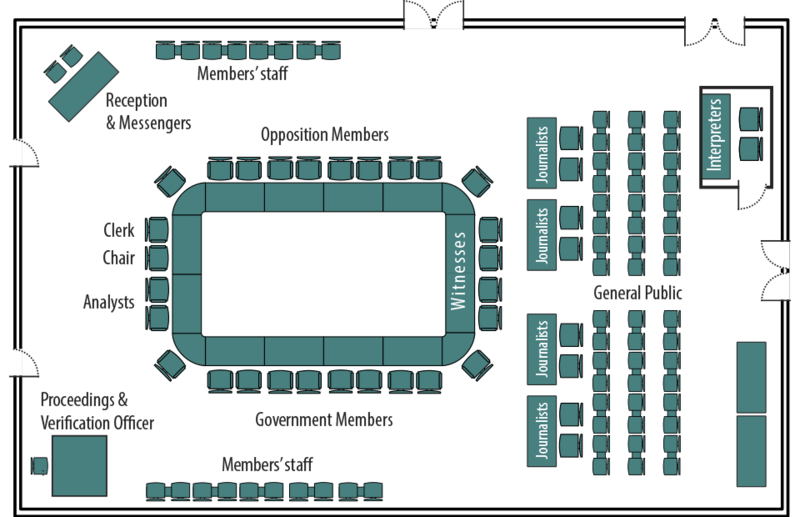 Is there technically such a thing as a government member on a committee, in a practical sense, or would that have to be a member of the executive in the House? You're getting well beyond my scope of expertise on that point. Let me just ask. I'm wrong. Even a government member could not move this amendment. I appreciate that clarification. All kidding aside, all members would be seen as equal on the committee. Perhaps it's not the appropriate forum for this, but I'm just wondering whether this type of amendment would be in order at report stage or third reading. If it's in the House it is in order because a minister could move it. It is out of order, but I do believe that Ms. May still has the opportunity to speak to her amendment, even though the ruling that NDP-16 is out of order means that therefore PV-2 and CPC-15 are out of order. She still has the right to speak. Yes, and that's because those were the terms of the motion passed by this committee. Otherwise, I'd be able to bring this amendment forward before the House at report stage. That's just to clarify things for people who might have forgotten the terms of the motion. I just want to briefly say I'm very pleased with the creation of a commissioner. It's my belief, and I hope the government will consider, as my amendment would do, giving the option of the person's being full-time. In the course of Bill C-51 being examined in the 41st Parliament, we had the advantage of hearing from former Supreme Court justice Mr. Justice John Major, who chaired the Air India inquiry. His advice wasn't taken by the committee at that time, but I believe that a lot of what he said before the committee on Bill C-51 is reflected in the creation of an intelligence commissioner. Mr. Justice John Major, testifying then—and I participated as actively as I was allowed in those committee hearings—said that Bill C-51 was fatally flawed because there was no “pinnacle review”, that was his term, that you needed to have someone like an intelligence czar, someone in a security position, for direct oversight of all the disparate intelligence agencies that we have within Canada so that they do not trip over each other. He spoke to an issue that Glen Motz mentioned earlier. He said it was human nature to keep information from other agencies. He said that his experience in the Air India inquiry was that the RCMP didn't want to share their information with CSIS, and that CSIS didn't want to share their information with the RCMP. He was very clear on that. Given the importance of this position—and I certainly support its creation in Bill C-59—I would urge the government, given the extraordinary position of studying this now, before second reading, to seriously consider bringing forward a motion before the bill reaches third reading to allow the intelligence commissioner to be full-time as well, or part-time, at the option of the government. Thank you for your intervention on your motion. It's out of order. I'm assuming that you want to speak to CPC-15, Mr. Motz. You and I share that. —but when I look at NDP-16, and then I look at PV-2, I'm challenging the ruling on admissibility because they're different. They're different, and if they're not the same.... If they were identical, then yes, I would say they would be inadmissible, but they're not the same. There's an “and-or”. For example, “functions on a full-time or part-time basis” is different substantively from what my colleague from the NDP proposed,. I don't know if you can rule it inadmissible, just from a procedural perspective. From a procedural perspective it requires spending by the crown, and that can't be moved. That's the issue. It's money. Before the meeting comes to an end, I just want to say that we, the members of the Green Party, the NDP and the Conservative Party, ask that the government take this into consideration and that it be given second reading. Seeing no further debate on an inadmissible motion, we'll move on. That deals with NDP-16, PV-2, and CPC-15. My clerk points out that it is one o'clock. I want to thank colleagues for a real and civilized debate. I thought we conducted ourselves well. I want to thank our officials for being here. We'll reconvene on Tuesday, if not earlier. With that, we will adjourn and in a few moments the subcommittee will reconvene in camera. The meeting is adjourned.